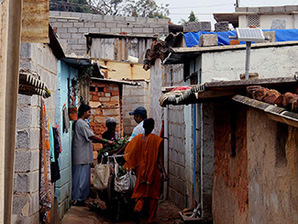 ASHRAYA NAGAR, India -- This slum on the outskirts of Bangalore is a mix of poverty and modernism. Most huts here have no attached toilet or running water, but solar panels of all sizes appear on their asbestos rooftops. Such contradictory scenes aren't rare across India. In the northern state of Bihar, small businesses charge their mobile phones with electricity generated from rice husk gasification. In farmlands here in south India, villagers harvest wind power to pump groundwater for irrigation. India is doing something important to empower the poor with renewable energy. Right now more than 1 billion people in the world live without electricity. But experts say that as the world's poorest people climb the income ladder, their demand for modern power and other comforts will further stress global energy supply while boosting greenhouse gas emissions. India, which has an unelectrified population almost equivalent to the total population of the United States, is becoming a global laboratory where such challenges are being resolved. There are no reliable data on how many renewable energy solutions have been implemented among poor Indians, partly because the products are often bought by individuals or donated by businesses and nongovernmental organizations. In the Indian slum of Ashraya Nagar, a renewable energy revolution is taking place. Photo by Coco Liu. But Andrew Jeffries, principal energy specialist at the Asian Development Bank's Delhi office, said there has been growing acceptance that clean energy technologies can be the best solution for energy access in certain circumstances. "The Indian government has launched several stimulus programs, and this has supported the diffusion of these technologies in areas where they are not yet commercially viable," Jeffries said. Some companies have thrived even without government financial assistance. Mumbai-based Greenlight Planet, for one, has sold about 655,000 solar-powered LED lanterns in India since 2010. Most of those sales came in the last two years. "Our sales growth is increasing at a super-fast rate," said Anjuli Pandit, director of global communication of Greenlight Planet. "I don't think this is an indicator that the demand is increasing -- it was always there -- but rather an indicator that we are building the resources to serve that demand." Pandit said her company more than quadrupled sales agents in India from 1,200 in 2012 to about 5,000 this year. What drove Greenlight Planet to do so is the market potential. While most of its targeted customers make $2.50 a day or even less, they opt for the solar product because it offers better lighting quality than their kerosene lanterns, avoids indoor pollution and provides a charging solution for mobile phones. Most importantly: It saves money. Despite the generous government subsidies on kerosene -- around $2 billion per year -- solar lighting is already a cost-effective option in off-grid India. According to a 2011 report published by Lighting Asia, the World Bank Group's arm to solve energy poverty, the lifetime cost for a solar lantern with a two- to three-year time frame is $18; by contrast, kerosene used to meet that need during the same period costs $38. Fuel prices increase day by day at the same time the cost of manufacturing renewable energy equipment is decreasing, so the economic factor has persuaded Indian policymakers to support the switch. Renewable energy systems were delivered to 905 villages from 2011 to 2012 through a government program. The Ministry of New and Renewable Energy is now spending an additional $88.8 million on decentralized solar and small hydro technologies in north India's Ladakh district, developing the largest off-grid renewable energy project in the world. Yet much of the energy upgrade among poor Indians happens in a smaller and quieter manner. Some families install a laptop-size solar panel on their roof. Others team up to build a village-scale biomass-based power plant that delivers the generated electricity to each household through mini-grids. There are also people who enjoy renewable energy technologies without buying them. Omnigrid Micropower Co. Pvt. Ltd., more commonly known as OMC Power, allows rural Indians to rent battery-operated energy access solutions -- such as LED lanterns and power boxes that can run a few lights and appliances -- at a daily rate close to villagers' existing fuel expenditures. The equipment is charged at OMC's micro-power plants using sun, wind and biogas, and delivered to the villagers twice a day. OMC Power also supplies electricity by cable to telecommunication towers that are located in off-grid areas and otherwise have to run on expensive diesel. Its long list of clients includes Bharti Infratel, an Indian telecom giant with annual revenues of more than $1.6 billion, but villagers are OMC's biggest financial contributor. "When we started out, we thought to mainly sell electricity to telecom companies, and whatever left would be for villagers. The sales in rural communities were considered as a bonus," recalled Pär Almqvist, the company's chief marketing officer. "It turned out to be the other way around," Almqvist continued with a laugh. "After one year, more than 50 percent of our revenue came from the sales in rural communities." OMC Power now operates 11 micro-power plants in Uttar Pradesh, India's most populous state. The company expects to reach 100 plants within a few months. "Why are we growing so fast? Because of the demand," Almqvist said. "Rural communities are burning hundreds of rupees of their hard-earned money on buying kerosene for lighting, and poor kerosene light hurt their eyes. So when they have a cheaper and better lighting solution, they will switch." OMC Power won an award this year at the World Economic Forum for profitably delivering clean energy for the poor, but many of its peers are suffering from a loss or have to survive on investors' money. As Jeffries of the ADB explained, although the market potential for powering off-grid India through renewable energy is huge, finding the right business model can be the biggest challenge. Other challenges that poor-oriented renewable energy solution providers face include a lack of awareness of the technology or resistance to it caused by previous bad experience with substandard products. It is also hard to establish after-sales networks in remote regions, and many Indians can't afford the upfront investment for the equipment even though it is cheaper to use in the long term. Industry players are scrambling to fix the problems. Barefoot College, an NGO headquartered in Tilonia, India, has turned illiterate grandmothers into solar energy technicians. To help low-income Indians harness the sun with less financial stress, a Bangalore-based solar startup called Simpa Networks is developing a new payment system. Known as "pay as you go," it allows customers to start using a small solar array after placing a down payment of 20 percent of the product price. The rest can be paid back gradually within two years. Although the system passes the upfront investment burden to the company, "we are still in a better position than our customers to get finance," said Paul Needham, Simpa Networks' co-founder. The company received financial support from Dutch donors to sell solar energy products to 2,000 families through pay as you go. It plans to raise enough funds for 20,000 families by 2015. Some Indians have already benefited. Among them is Geetanjali, a 20-year-old woman who goes by one name and lives with her parents and three sisters in Ashraya Nagar, the slum at the outskirts of Bangalore. Geetanjali's home is surrounded by electric lines, but it is not connected to any of them because the settlement was built without permission. So her family relied on a kerosene lantern for lighting. Its dim light forced them to do nothing but sleep after dark. They also had to walk to a nearby store twice a day to recharge mobile phones. Geetanjali's parents considered buying a solar array as their neighbors did, but the product costs more than their monthly income. Since their jobs are temporary, banks refused to give them a loan. The family was unable to switch until the pay as you go option arrived this year. "We are very happy about it," Geetanjali said of the solar panel installed on her roof three months ago. "With the light from solar, my sisters and I now can study in the evening." A college student majoring in fashion design, Geetanjali practices painting and sewing until midnight. "I'm studying very hard because I want to open my own designer shop after graduation," Geetanjali explained. "That's my dream."